Free Amino Nitrogen by OPA (FAN) is a test that allows to manage correctly the alcohol fermentation. In fact the lack of Nitrogen can cause a slowing-down or even the stop of the fermentation, compromising seriously the quality and the organoleptic characteristics of the beer. 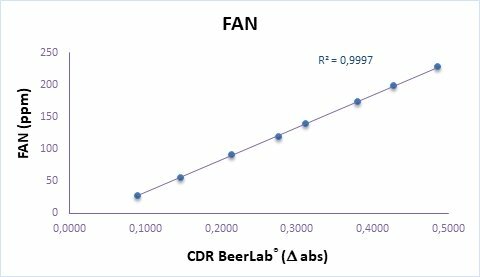 FAN by OPA analysis with the CDR BeerLab® method allows to determine the concentration of the two components separately, giving the possibility to carry out with accuracy the appropriate corrections before and during the alcohol fermentation. The kit for the Inorganic Nitrogen is selective for the ammonium ion and allows to adjust with accuracy a possible addition of sulfate/hydrogen-ammonium phosphate in the wort. Free Amino Nitrogen by OPA (FAN) can be measured using CDR BeerLab®, a system which enables you to carry out a wide panel of chemical analyses on beer and water, using a single instrument, in a process that is faster and simpler than traditional methods. Calibration curve obtained with samples of known values. The α-amino Nitrogen reacts in presence of N-acetyl-L-cysteine with o-phthalaldehyde forming an isoindole derived. The difference of absorbance, measured at 366 nm (end point), is correlated with the quantity of Organic Nitrogen expressed in mg/L of Nitrogen. Use on wort. For higher accuracy in the analysis of wort we recommend to centrifuge the sample. Free Amino Nitrogen by OPA (FAN) was last modified: February 19th, 2019 by CDR s.r.l.